Bilal and Seth see each other in the waiting room at the campus health facility. It’s really cold outside and they’re both very sick. 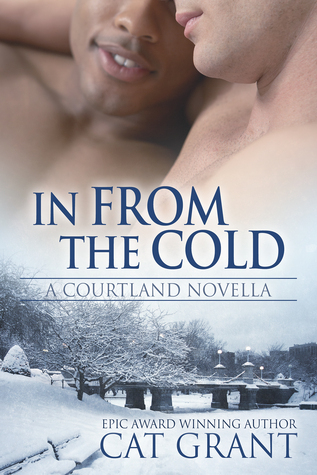 They find each other again walking home, and Seth invites Bilal to his house, just to get out of the snowstorm. To avoid the long walk home that would be near to impossible due to his fever, Bilal accepts the invitation. This is a short story, so, by necessity, the plot moves along quickly. Even with that, I was a surprised at how abruptly Bilal and Seth went from secretly longing for each other to acting on it. It was very sweet, though, with Bilal conflicted and Seth trying to understand. It was a sweet and hot story, but it definitely feels like just the beginning. It’s no cliffhanger, but Seth and Bilal definitely have issues to work through. This story is related to the Courtland Chronicles series – Seth is the son of the main characters. It stood alone very well, though. I’d recommend it for readers who enjoy a short and quick m/m romance.